Shanghai may be large, but even this massive metropolis has its green patches. Spend part of the day picking fresh fruit in Zhaotun Village, known as the "hometown of the strawberry," on this private 6-hour tour from Shanghai, and then tour the famous Zhujiajiao Water Village. This tour also includes an organic lunch at a farmer's home and can be customized to suit your interests. In addition, boat ride and local lunch at a local farmer’s home are also inclusive. My family enjoyed the day spent at zhujiajiao as well as the fruit picking activity. Our guide, Wilson is helpful, initiative and friendly. The itinerary is relaxing as we were not rushed. My kids had a fabulous time and were reluctant to leave the fruit farm. It was a wonderful trip. We thoroughly enjoyed our trip and had a great time. Everything was planned out wonderfully and we are going to go back with a lifetime of memories. Our guide was very knowledgeable about the place and the small pieces of information she gave us were very appreciated. She was very friendly and very easy to get along with, especially for our 3 year old daughter who had a great time because she ensured that she was comfortable the entire time. Thanks a lot for this great day trip! Berlin is a very nice and knowledgeable guide. She explained things such as the history to us clearly. She can converse well in English. I would certainly recommend my friends to join this tour if they are in Shanghai. 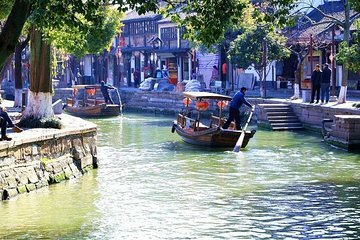 The Zhujiajiao Water Town Boating Tour with Fruit Picking was a beautiful tour to begin our trip to China. Alana was wonderful and made the whole tour a fabulous experience - despite it raining for much of the day. Alana's understanding and knowledge of the town made the tour informative and more importantly great fun. The tour began with a visit at a local farm where the kids enjoyed picking cucumbers (as the time we visited was out of season for grapes, strawberries or oranges). Alana also took time to introduce some basic Chinese phrases to the kids - which they enjoyed. We had lunch at a local restaurant overlooking the God City Temple Bridge. The food was incredibly fresh and the shrimp soup was a highlight of the meal. Alana was very diplomatic in encouraging my son to order something other than the chicken giblets! The boat trip through the water towns canals was perhaps the highlight of the tour and provided a fantastic way to gain a glimpse of ancient Yangtze Delta life. A walk through the KeZhi Garden was very peaceful and although busy had no large tour groups. Alana than walked us back through the town over the old stone bridges and picturesque narrow streets. This walk showed us many well preserved examples of Ming and Qing dynasty architecture. A five star experience with a special thank you to our guide Alana.